Spray inside of 3 1/2- to 4-quart slow cooker with cooking spray. In 10-inch skillet, cook bacon over medium heat 6 to 8 minutes, stirring occasionally, until crisp. Remove from skillet; place in slow cooker. In small bowl, mix garlic, rosemary, salt and sage. Rub all sides of pork roast with garlic mixture. Add roast to skillet; cook 4 to 6 minutes, turning occasionally, until browned on all sides. Remove roast from skillet; place in slow cooker. Pour wine over roast. In small bowl, mix flour and water until smooth. Remove roast from slow cooker. Strain juices from slow cooker into 4-cup microwavable measuring cup or medium microwavable bowl. Stir flour mixture into juices until smooth. Microwave on High 3 minutes or until thickened; stir. 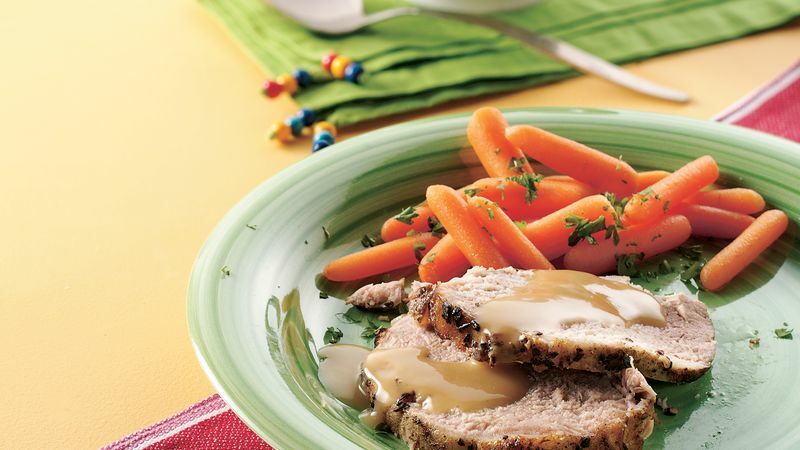 Cut roast into slices; serve with gravy. Don't trim the fat from the roast or remove the netting before browning or slow cooking. The fat keeps the roast moist and adds flavor, and the netting holds the roast together. Remove the netting before serving.